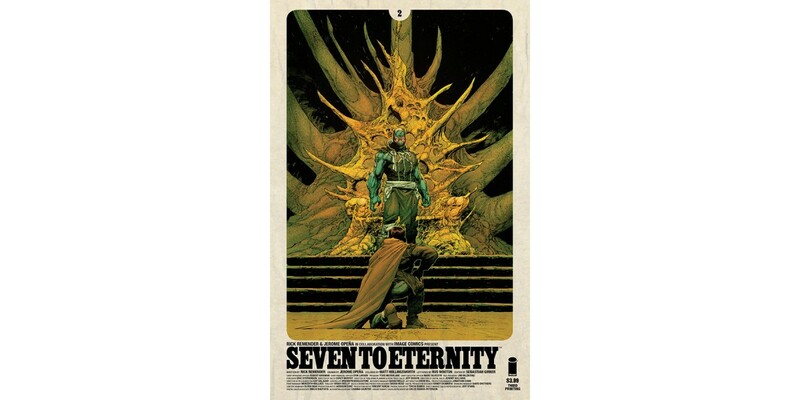 Image Comics is pleased to announce that SEVEN TO ETERNITY #2 and #3 of the bestselling series written by Rick Remender, drawn by Jerome Opeña, and colored by Matt Hollingsworth—SEVEN TO ETERNITY—has gone back to print again in order to keep up with ongoing growth in customer demand. SEVEN TO ETERNITY #2, 3rd printing (Diamond Code OCT168988) and SEVEN TO ETERNITY #3, 2nd printing (Diamond Code OCT168989), SEVEN TO ETERNITY #4 Cover A by Opeña and Hollingsworth (Diamond Code OCT160635), SEVEN TO ETERNITY #4 Cover B by Tocchini will be available on Wednesday, December 28th. The final order cutoff deadline for comics retailers is Monday, December 5th.